INTERVIEWER: You were new to NJSEA this past academic year. What made you want to join? DANIELA CEBALLOS: One of my professors at Middlesex County College told me about NJSEA, and I wanted to belong to a group with people that shared my interests. My professor also mentioned all of the benefits that would be available to me, like Professional Development hours. I really wanted to feel like part of something important, and my time with NJSEA so far has been great. INTERVIEWER: I’m glad she encouraged you to join because you’ve been a great addition to our team. Being a newer member, why did you decide to run for the state secretary position? CEBALLOS: I decided to run because I wanted to be involved in a larger leadership role and show my students and others that it doesn’t matter who you are; you can make a difference in the world if you work hard enough. INTERVIEWER: That is very true. Working hard takes you far in life, and it is wonderful that you want to teach your students by example. 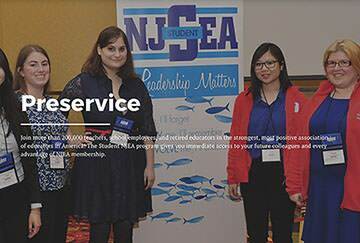 What do you hope to contribute as a new NJSEA state officer for this upcoming 2017 – 2018 academic year? CEBALLOS: I want to bring more awareness about the benefits of membership to preservice educators. Another, major goal for me is to bring more diversity into the profession, so I want to advocate for more people from different backgrounds and majors to join us. INTERVIEWER: I think those are great goals to have for NJSEA. I know other than NJSEA you have already been working in a classroom setting as an instructional assistant. I think that means you have a lot of real experience you can offer advice to other preservice educators. What advice would you give to them? advice is to work as an ESP for a year, if you have the chance to do so, because you will get to see different teaching styles and approaches to classroom management without having to worry about doing lesson plans. Being an instructional assistant has helped me see how a classroom can run without the pressure of following a lesson plan by myself. Another positive aspect of being an instructional assistant is being with the same children every day and building a close bond with them. In fact, one of my biggest fears is getting too attached to the students and not knowing what to do when they all leave at the end of the year, but being an instructional aid is helping me overcome that fear because I know that my children need to move on, keep learning, and become even better in all that they do – and so do I.